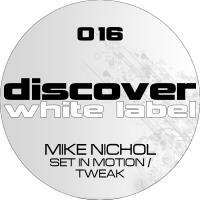 Mike Nichol debuts on Discover with this killer two track E.P. which has already gained the support of Armin Van Buuren and is the perfect follow on to his recent critically acclaimed release with Armada. Mike can already list amongst his supporters the likes of Armin, Ferry, JOC, Aly and Fila and Askew and this release will surely cement his place as one of the scenes most exciting new producers. Both tracks are packed full of big room class and deliver in true "Discover" style all the drive and energy that you have come to expect from the label. 2010 should be a good year for Mike - and this release shows us exactly why!!! 'Set In Motion / Tweak' is available now from Beatport and iTunes.